Set up a private room for your new cat, complete with litterbox, food, water, scratching post, toys and a comfortable bed/s. The resident cat/s and the new cat will likely sniff under the door and may vocalize as well. Once both parties are acting fairly relaxed about what/who is on the other side of the door (This usually takes one-two weeks. ), try cracking the door a hair and allow the cats to investigate a little more closely. If there is hissing and/or growling, close the door and let everyone calm down before attempting this again at a later time. Once there is no drama about these nose-to-nose visits you can allow the cats to have supervised face-to-face visits. It can be helpful to offer both cats treats and toys during these visits so that they form positive associations about being around the other cat/s, as well as to distract them a bit from the new cat/s. If there is more than some mild hissing and/or swatting, separate the cats as calmly as possible and retry the introduction the following day. Avoid punishing either cat, since this will just escalate their stress level and possibly result in them associating the other cat/s with negative things. 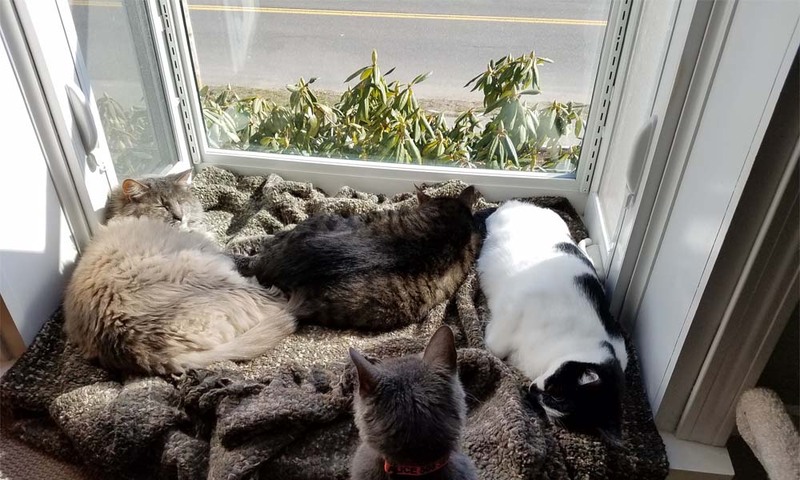 It usually takes weeks to months for new cats to fully adjust to each other so go slowly and have realistic expectations, realizing that the cats may never be best of friends, but can usually learn to co-exist peacefully.